Dr. Nestor was raised in Boca Raton, Florida and graduated from Saint Andrew’s High School. As an avid runner, she was known for both her academic and athletic excellence. After attending Cornell University, she returned to South Florida to be close to her family, friends, and the warm weather. As the first doctor in her family, Dr. Nestor did not always know that medicine was her calling. However, she realized that medicine, particularly dermatology, allowed her to combine her passion for science, photographic memory, and ability to form personal relationships with patients. She continued her training at University of Miami/Jackson Memorial Hospital, where she was honored to care for patients with some of the most complicated medical diseases. 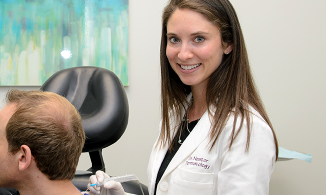 Dr. Nestor has written multiple publications in leading medical journals. She completed a year-long basic science research fellowship in medical school, during which she presented her research at numerous national conferences and received many awards from leading dermatology societies. Her focus is on medical dermatology, with a special interest in diseases such as skin cancer, psoriasis, eczema and acne.